Here at VeloVoices, we freely admit we don’t have enough knowledge or television coverage to write about women’s cycling with authority. However, Alberto Celani, an Italian journalist, former press officer for Astana Be Pink and economics advisor to the UCI Women’s Cycling Working Group, has kindly offered to help us out. Here is his interview with Orica-AIS’s Annemiek van Vleuten. Thirty-three-year-old Dutch rider Annemiek van Vleuten has recorded an impressive 32 victories in her career to date, including a Dutch national time-trial championship and a silver medal in the elite women’s UCI road world championships in Florence, 2013. Recently I sat down with her to talk about her career and the changes that women’s cycling is going through. Alberto: How and when did you get into cycling? Annemiek: I am an example of a multi-sports person who started cycling relatively late. I was 22 years old when I entered the sport. Before, I played football and did a lot of running so I had a good physical condition. Alberto: With women’s cycling becoming more professional, do you think that would still be possible in the future? Annemiek: I don’t see why not, cycling isn’t super technical. With a multi-sports background, if you’re not afraid to race in the peloton and the physical genetics are okay, you can start late. I find that I am still ‘fresh’ and looking forward to racing while some riders who have started really young, racing as juniors, sometimes get tired and lose some of their motivation as they become older. Alberto: What changes have you experienced in women’s cycling in recent years? Annemiek: The teams have become much more professional, some riders are even paid so they can be full-time professional cyclists. The quality of the peloton has improved; there are more riders at a higher level. For example, more riders can race faster, such as with 50+ km/hour average in team time trials! This is all good. Alberto: The introduction of the UCI Women’s World Tour has meant changes in both races and race programmes but there are still many issues to resolve to ensure greater coverage of women’s racing. Where do you think improvements are still needed? 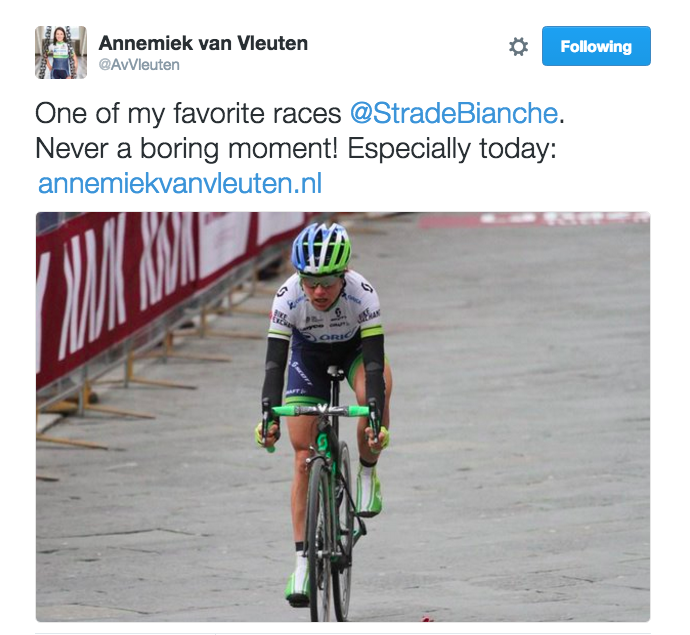 Annemiek: Not all the women’s races have live television coverage. It is improving – more races such as Omloop Hageland have live race coverage – but often the distribution of the coverage is limited. It would help if all the men’s WorldTour races also organised a women’s race. I appreciate that this is easier for one-day races but it would be another step in the right direction and it would capitalise on an already captive market for the men’s race. Alberto: After Trixi Worrack‘s crash at Trofeo Binda a week ago, what are the safety issues you face while racing on European roads? Annemiek: Hmm, that’s a hard question to answer. I think we have a responsibility to help each other to keep the racing safe and not to go crazy on the roads when it’s not necessary. In addition, not all racers feel it’s their responsibility to alert those behind to up-and-coming dangers. We need to communicate more in the peloton, particularly when there are parked cars on one side of the road or the other. Alberto: Women’s races tend to be more spectacular because they’re shorter so the race is on from the very start. I understand there is a move to make them longer; do you think that’s the right thing to do? Annemiek: I think it is crazy the difference in distance between men’s and women’s races. It would be nice to have SOME races that are really long for the women, to show we are capable of doing those distances! But, for the Women’s WorldTour, I think it’s not interesting to make them longer. A better start would be to have a women’s race for every WorldTour race in the men’s calendar and, rather than make it longer, make it harder with more climbs as in Strade Bianche. I like it that our races are spectacular from the start, so it would be better if it could stay like that. I don’t like the “100km rule” in women’s elite stage races [see below]. I think this rule implies the UCI underestimates women’s cycling and I don’t understand why that rule is there. Now we sometimes have stages of 90 or 100km a day and that is too short – it’s sometimes better to go training than to do a stage race. Organisers sometimes make a “solution” with putting in a short prologue on the first day, which I really like, so that helps them to make some of the other stages longer. But I think we need stages of 120-140km. For example, I like the Drenthe races. The organisers go to the limit and have 140km races. That is very good particularly for a (flat) stage race to make it that bit harder. Alberto: You mentioned training. How and where do you typically train? Annemiek: I always train with boys from the Continental teams, but also with some male friends to have company during long endurance rides. Only when I have to do hard interval training do I usually go alone, because it is much harder to train together. I live in Wageningen, which is in the centre of Holland, 40km to the east of Utrecht. The small hills from Ronde van Gelderland are my training area. I really like the countryside and I like riding among the trees. Alberto: For amateur riders, where are the best spots to train and ride? Annemiek: For me that is Trepalle/Livigno in Italy. I stay there for altitude camps and then I like to ride to the Gavia, Stelvio and Mortirolo. Of course, I enjoy the good Italian food and coffee after training! My second favourite place is in Tuscany, around Castagneto Carducci where we always go for training with our Dutch national coach Johan Lammerts. We stay at a nice hotel called Zi Martino where I really feel at home. My third choice would be Gran Canaria, the best place to go in December and January because of the great weather and nice climbs. Note: UCI Rule 2.6.008 states there’s a maximum daily average of 100km for women’s elite stage races where stages mustn’t exceed 130km in length. These limits increase respectively to 120km and 140km for women’s WorldTour stage races. You can follow Annemiek van Vleuten on her official Website, Twitter @AvVleuten and Facebook.